Reporting project from WBEZ and the Better Government Association. Contributed to editorial planning for project and served as the lead editor on four radio features for WBEZ. Helped to shape pitch for NPR version and coached audio reporter throughout the six month reporting process. If you work in public radio, you might just be on a sugar detox right now. And no, that’s not a comment on the stereo-typically healthy diets of public media staffers. Public radio folks across the country recently took part in the 6th annual Public Radio Cake Week. The tradition started at Vermont Public Radio when several staffers’ birthdays fell around the same time in April. Rather than have one cake to celebrate, the station leaned into the sugar consumption and celebrated with a week of cake. As other member stations learned about the sugar binge, the event took on a competitive quality. Stations spend all week baking, with each day centered around themes like news story of the year, historic events depicted in cake, “this is not a cake,” station pride and public radio stereotypes. This year a record number of stations participated with cakes that were as visually impressive as they were hilarious and, one can assume, delicious. On this week’s episode of The Pub, we hear from four Cake Week winners about their sweet victories and why they think the event is so special. And there’s no use having a surplus of cake if you have no utensils to eat it with. 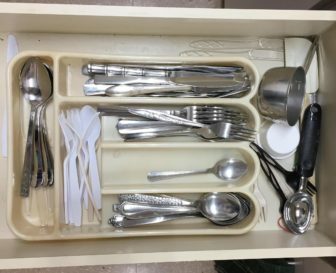 We hear from staffers at two public media stations who recently found themselves short of forksand spoons at their stations. They took to Twitter to complain and got packages from a little utensil fairy at NPR. The collaboration kicked off last month and has already yielded cooperation from state agencies and won the support of Gov. Wolf. On The Pub, I talked with Kathleen Pavelko, president and CEO of WITF in Harrisburg; David Solomon, EP at WQED in Pittsburgh; and Tom Currá, president and CEO of WVIA in Pittston. What are public media’s classical stations doing to innovate? For one station, the answer involves a throwback to an earlier broadcasting era. Back in the day, radio and TV stations all had jingles. But that tradition has fallen out of fashion — few stations have their own dedicated theme. Up until last year, KMFA in Austin, Texas, didn’t either. On The Pub, KMFA Director of Broadcasting and Content Anthony McSpadden shares the story of how the station commissioned local composer Dan Welcher to write a theme to commemorate KMFA’s 50th anniversary. Other composers have written variations on the theme. It’s just one of the many ways KMFA is active in Austin’s vibrant music community. The Pub: What’s Next for WNYC? It was only a matter of time before public media had its own #MeToo moment. And it’s had more than one over the past six months, with hosts and senior leaders changing roles or no longer in their jobs following a range of accusations about harassment, bullying and inappropriate workplace behavior. Such allegations have a particular sting for public media’s listeners and employees. Newsrooms that hold public officials and other organizations to account for such behavior seem to be unable to effectively deal with the problem in their own shops. And even as they respond, some staffers say they’re too late. On this episode of The Pub, we look inside what one writer described as a culture of bullying and exploitation at WNYC in New York City. Boris Kachka’s article about the station was published by New York magazine. You’ve done your interviews, written your script and filed your story. But did you do one last fact-check? On this episode of The Pub, I look at what newsrooms are doing about fact-checking. No longer just for magazines or long-form projects, some public media newsrooms have begun to apply more robust fact-checking to their daily and feature work. Our audiences expect our stories to be accurate, and on top of that, they expect our journalists to hold newsmakers to account for falsehoods that come out in interviews. But how do we balance the need for rigorous fact-checking with the daily pressures of filling newscasts and covering our communities? WFPL News Director Erica Peterson shares what her newsroom has done to avoid errors big and small. The Pub: How Do New Hosts Hang On To Audiences While Still Being Themselves? So your favorite podcast has a new host! Do you keep listening? On this episode of The Pub, I take a look at how a show survives a changing of the guard. For new hosts: How do you fill your beloved predecessor’s shoes while still honoring the longtime audience? When you inevitably make changes, will they run for the hills? Nobody knows this challenge better than journalist Robert Costa. He’s a reporter for the Washington Post and took over as moderator last year for PBS’ weekly public affairs program Washington Week. Costa describes how he approached what could have been a tricky transition after the death of previous longtime host Gwen Ifill. Plus, I check in with food writer and host of public radio’s The Splendid Table,Francis Lam, who made the jump from filling in occasionally to taking over the program permanently.